Whether your child is celebrating a great American holiday or simply feeling patriotic, this American flag craft is just the ticket. If you are looking for a paint-like activity minus the mess, this creative project is the perfect alternative. Cut the cardboard into a rectangle that is approximately four by six inches in size. Parents may need to do this step for younger children who cannot cut through a heavy material. Have your child use the ruler to measure the rectangle for the star area and the stripes. Use math to make sure that each stripe is the same size. Pull the clay apart into small, two inch, segments. Starting with the bottom strip, spread pieces of red clay across the cardboard with a fingertip. This will be similar to finger painting. Make sure that your child spreads the clay thin. It should look more like a layer of paint than a pile of clay. Repeat with alternating white and red stripes and blue for the star area. Create small stars in the blue area by pressing tiny pieces of white clay onto the blue clay. It is alright if they don't look exactly like stars. Try to make a group flag with the entire family. 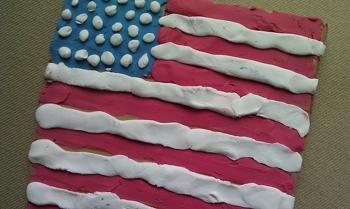 Create a large, 11" x 14" or larger, clay flag with detailed stars that everyone helps to work on! Get to know the U.S. states a little better with a state flag coloring page featuring the flag of California. Learn about the Colorado state flag with a coloring page, which includes a fun fact about the symbols on the flag. Introduce your child to the Louisiana state flag with a coloring page! He'll read about the symbols on the flag as he colors.